Info Commons Help Desk - My UTORvpn client hasn’t been used for a few months and it no longer connects, although it did in the past. My UTORvpn client hasn’t been used for a few months and it no longer connects, although it did in the past. 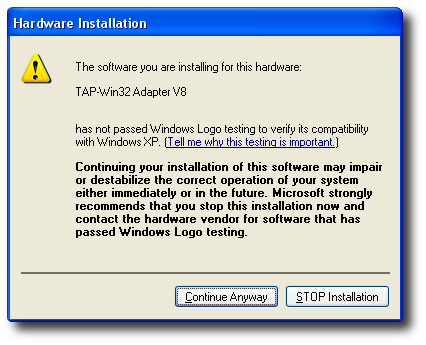 The packaged client was updated in 2007 - earlier versions will not work. If you installed UTORvpn on your Windows system before the 2007 update, you will need to follow these steps to upgrade your Windows client. Remove "OpenVPN" from the "Add/Remove Programs" dialog in the Control Panel. Go to the UTORvpn website and log in with your UTORid and password. 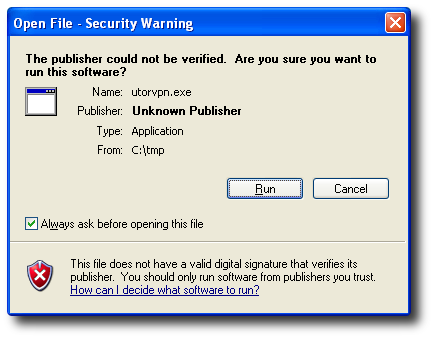 Follow the instructions there to create and download your UTORvpn auto-installation package. To install UTORvpn, you must be logged in as a user with administrator privileges. Note: Although you must install OpenVPN as a user with administrator privileges, CNS strongly recommends that users not run Windows in an account with Administrator privileges. OpenVPN can run under a non-administrator account, and a page on the UTORvpn site describes how to set up your account to allow this . This error message is not a problem, simply click Run to continue. Answer Continue Anyway to this question because this component is necessary for running OpenVPN. That's it! Now that you have installed UTORvpn on your computer, you can learn how to start up and use UTORvpn .